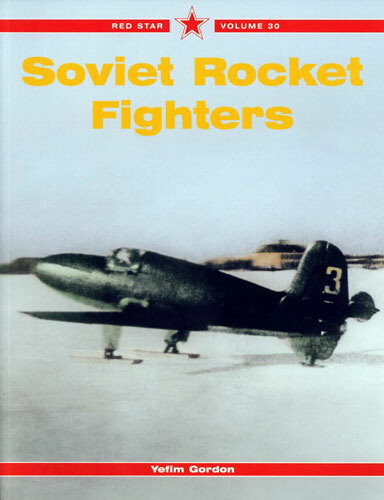 Advantages: An examination of the experimental rocket fighters of the USSR. Red Star Series Number 30 is yet another excursion into the more obscure aspects of Soviet and Russian aviation development. From the 1930s to the 1950s rocket fighters were seen as a genuine alternative to piston engine designs and later turbine powered designs. The fact that the British continued experimenting with designs such as the SR53 when jet designs were entering widespread service is testament to the though processes which saw a niche role for rocket powered interceptors. The Soviets were no different in this regard with a range of designs from the BI which first flew in 1942 to the Mikoyan I-270 and other post war high speed research designs. This book again authored by the prolific Yefim Gordon is a comprehensive examination of the subject. From the early war designs to post war exploitation of captured German technology, Gordon covers all aspects of Soviet rocket fighter programs. The final chapter is of particular interest, documenting the Soviet high speed research program which is very reminiscent of the parallel X-1 program which resulted in Chuck Yeager breaking the sound barrier. This book will not be to the taste of all, and the applicability as a modelling reference is limited due to the non-existence of kits of the subjects at this time. However for those with an interest in aviation history this volume will, like many Red Star Volumes, expand your knowledge into some of the lessor known corners of Soviet/Russian aviation history. Recommended for fans of the more exotic Russian aviation types.